INDIO, Calif. (KABC) -- The driver of a big-rig who allegedly caused a passenger bus crash that killed 13 people in 2016 near Palm Springs has been arrested in Georgia. Authorities from a multi-agency fugitive task force said Bruce Guilford, 51, was taken into custody after being charged by the Riverside County District Attorney's office with 13 counts of vehicular manslaughter with gross negligence, 12 counts of felony reckless driving causing injury and 17 misdemeanor counts of reckless driving causing injury. Thirty-one other people were injured in the Oct. 23, 2016 crash on the 10 Freeway just outside of Palm Springs. 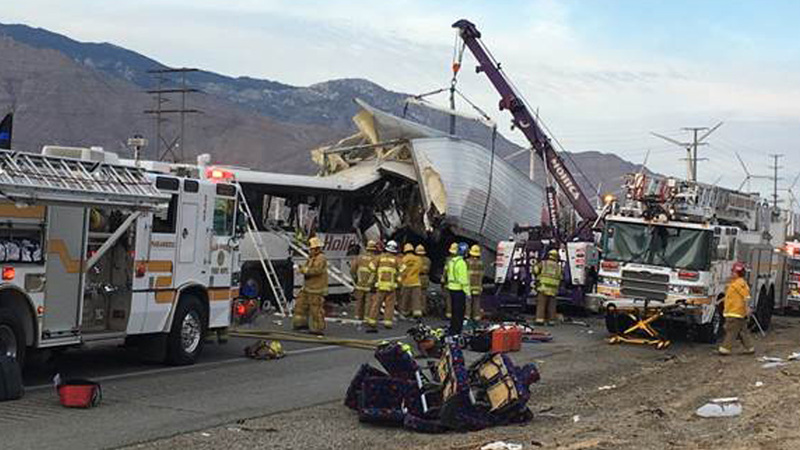 Thirteen people were killed and 31 others injured Sunday morning when a tour bus slammed into the back of a semi-truck on the 10 Freeway north of Palm Springs, a California Highway Patrol spokesman said. Authorities said Guilford fell asleep in the westbound lane of the freeway after he stopped his truck amid a routine construction-related "traffic break" conducted by the California Highway Patrol, which halted all lanes of traffic temporarily. When CHP officers reopened the lanes, Guilford remained stopped with the truck's parking brakes engaged, authorities said. A motor coach headed from Red Earth Casino in Thermal to Los Angeles crashed into the back of Guilford's stopped big-rig at 76 mph, killing 13 passengers and injuring 31. It was later revealed by CHP investigators that Guilford had regularly violated maximum driving-time regulations by falsifying a travel log. Guilford had likely not slept in a extended period of time leading up to the accident, investigators said.